iOS 9.3 officially supports hiding stock apps. Here’s how to do it. 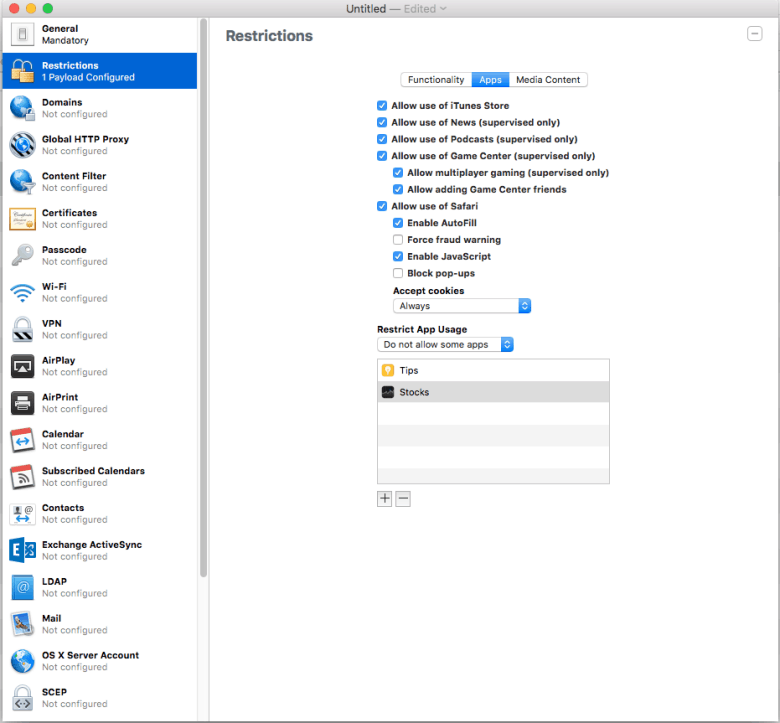 Apple Configurator 2.2 beta can hide your unwanted apps for you. iOS ships with a few dozen default system apps, all of which take up valuable room on your homescreen since Apple won’t let users delete them. Until now, the best you could do is squirrel them away into a folder, or jailbreak. But with iOS 9.3 Beta 1, it looks like Apple is finally making it possible to hide unwanted system apps. Here’s how. As seen on Reddit, it appears that iOS 9.3 adds the ability to hide applications on the home screen. Here’s how to do it, according to Redditor bfodder. Just to note, you have to configure the General section in order to save the configuration profile. When you plug in your device, right click it, then Add > Profiles… Then navigate to the profile you just saved. You might have to then accept the install on the iOS device itself. You can find out additional Bundle IDs at this website. Convoluted? Sure. But set it up once, and this technique will keep those annoying stock apps hidden pretty much forever. If you like keeping a clean homescreen, this method beats some of the other fiddly hacks you can use to hide your apps.